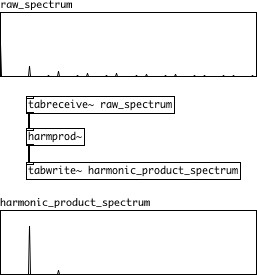 The Pd Spectral Toolkit facilitates spectral processing in Pd by providing objects that perform frequently used data transformations and calculations. This reduces the number of lower-level objects required to build patches while affording novel data interfaces and utilities, allowing users to spend less time making abstractions and more time implementing complex data manipulation algorithms. Currently the toolkit is compiled only for OS X. The Pd Spectral Toolkit was created by Cooper Baker under the supervision of Tom Erbe, supported by a grant from the University of California San Diego between 2012 and 2013. Special thanks to Miller Puckette for invaluable insight regarding spectral math and the Pd api. 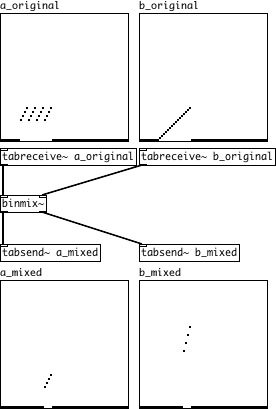 Baker, C., Erbe, T. "Pd Spectral Toolkit", Proceedings of the International Computer Music Conference, Pp. 410-413, Perth, Australia, 2013. 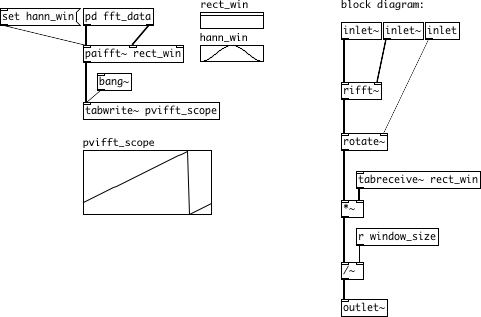 · Copy "Pd Spectral Toolkit" folder to "/Library/Pd/Pd Spectral Toolkit", creating /Library/Pd if it does not exist. Performs a logical not and comparison of two signals and outputs 1 or 0. Performs a logical not equal comparison of two signals and outputs 1 or 0. Performs a logical not or comparison of two signals and outputs 1 or 0. Performs a logical not operation on a signal. Performs a logical and comparison of two signals and outputs 1 or 0. Performs a modulo operation using the values of two signals and outputs the result. Performs a logical less than or equal comparison of two signals and outputs 1 or 0. Performs a logical less than comparison of two signals and outputs 1 or 0. Performs a logical equal comparison of two signals and outputs 1 or 0. Performs a logical greater than or equal comparison of two signals and outputs 1 or 0. Performs a logical greater than comparison of two signals and outputs 1 or 0. Performs a logical or comparison of two signals and outputs 1 or 0. Converts amplitude values to dB-FS decibel values. Converts amplitude values to magnitude values. Outputs ascending values from zero to block size minus one for each signal block. 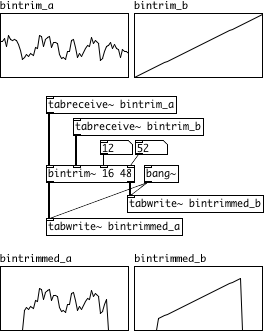 Outputs the maximum sample value in block a, the associated sample value in block b, and the index location of samples a and b for each signal block. 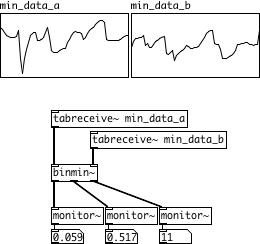 Outputs the minimum sample value in block a, the associated sample value in block b, and the index location of samples a and b for each signal block. Mixes inlet 2 values for all matching inlet 1 values. Mixed values are placed into location of largest inlet 2 value and all others are zeroed. Operates on one signal vector at a time. Outputs a float representing the value of a specific sample index in the signal vector once per block. Useful for looking at values of particular bins in spectral data. Sorts Spectral data according to left inlet values and outputs the data in ascending or descending order. 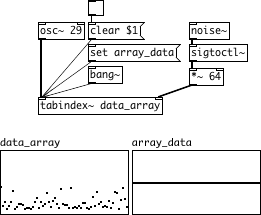 Zeroes spectral data outside of a specified bin range. Detects infinity or not a number values and replaces them with float or zero values. Replaces zero values within a signal vector with preceding adjacent non-zero values. Converts cartesian coordinates to amplitude values. Converts cartesian coordinates to dB-FS decibel values. Converts cartesian coordinates to magnitude and frequency pairs. Converts cartesian coordinates to magnitude values. Converts cartesian coordinates to phase values. Calculates the absolute value of a complex number. Adds two complex numbers and outputs the result. Performs complex division and outputs the result. Multiplies two complex numbers and outputs the result. Calculates the square root of a complex number and outputs the result. Subtracts one complex number form another and outputs the difference. Counts between minimum and maximum limits using an arbitrary increment value and wraps overflow back into counting range. Scales values from control range (0 to 1) to signal range (-1 to 1). Converts dB-FS decibel values to amplitude values. Converts dB-FS decibel values to magnitude values. Outputs a bang when DSP is turned on or when the DSP chain is reconstructed. 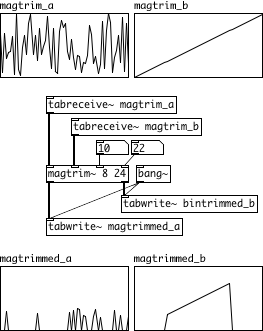 Assigns spectral frequency data to its proper bins based on frequency and magnitude. The frequency of greatest magnitude for each bin is selected and all other frequencies are ignored. An optional "unused" argument causes the object to output the ignored data. Converts magnitude and frequency pairs to cartesian coordinates. Converts frequency values to phase values for each bin of spectral data. Converts magnitude and frequency pairs to polar coordinates. Finds the fundamental frequency of greatest magnitude within a specified frequency range. Converts magnitude values to amplitude values. Converts magnitude values to dB-FS decibel values. Zeroes spectral data outside of a specified magnitude range. Samples a signal and outputs a float every 20 milliseconds. 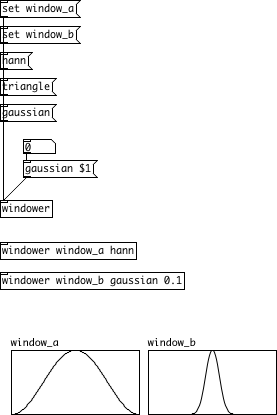 Generates window-size/2 sinusoids based on input magnitude and frequency pairs. Magnitude and frequency changes are linearly interpolated between block boundaries. 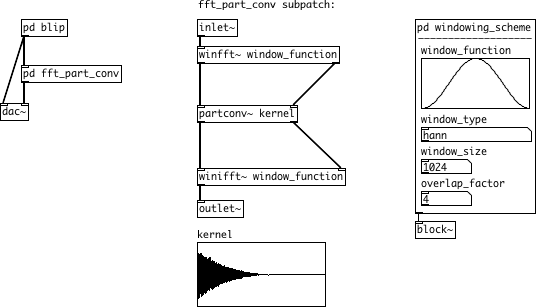 Applies a window function then rotates the signal vector before performing a forward real fast fourier transform. Performs a backward real fast fourier transform then rotates the signal vector, applies a window function, and normalizes output. 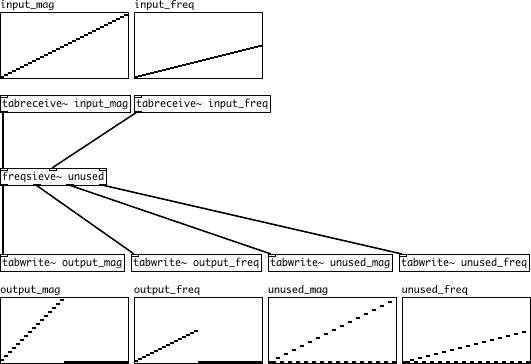 Performs partitioned convolution using cartesian coordinates with a convolution kernel stored in an external array. Finds peaks in inlet 1 spectral data, outputs peak values and associated data from inlet 2. 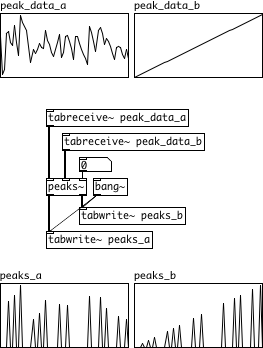 Optionally detects an arbitrary number of highest peaks. Calculates running sums of successive FFT frame phases for each bin. 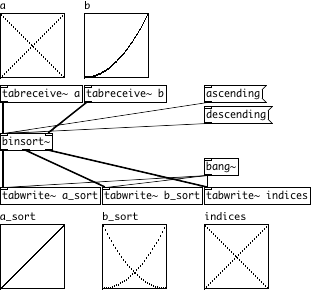 Calculates phase deviation between successive FFT frames for each bin. Converts phase values to frequency values for each bin of spectral data. 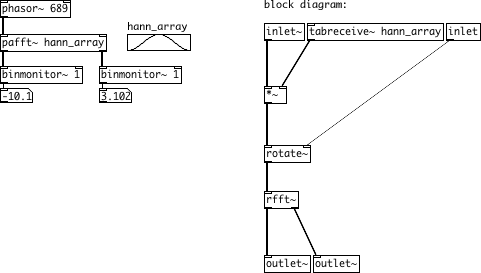 Wraps a signal between -pi and pi. Converts polar coordinates to magnitude and frequency pairs. 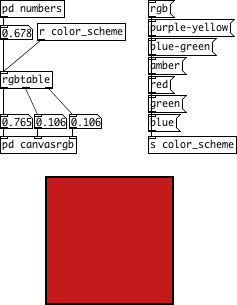 Outputs red, green, and blue values between 0 and 1 based on an input value between 0 and 1, according to the selected color scheme (default RGB). 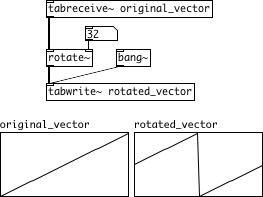 Rotates a signal vector by an arbitrary number of samples. Rounds signal values to arbitrary precision of up to 8 decimal places. Default is zero decimal places. Scales a signal from one range to another. Scales values from signal range (-1 to 1) to control range (0 to 1). 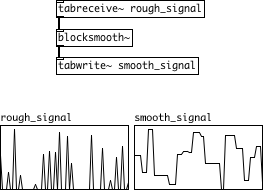 Writes signal values into a table at arbitrary locations and optionally clears the array at the start of each signal vector. Sends messages to an instance of the operating system's command line shell and outputs the results. Truncates signal values to arbitrary precision of up to 8 decimal places. Default is zero decimal places. Finds valleys in inlet 1 spectral data, outputs valley values and associated data from inlet 2. 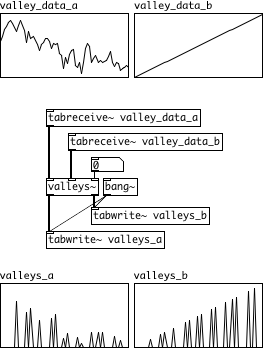 Optionally detects an arbitrary number of highest valleys. 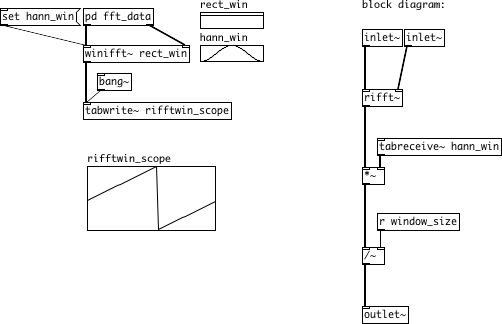 Writes normalized window functions into arrays. Applies a window function then performs a real fast fourier transform. 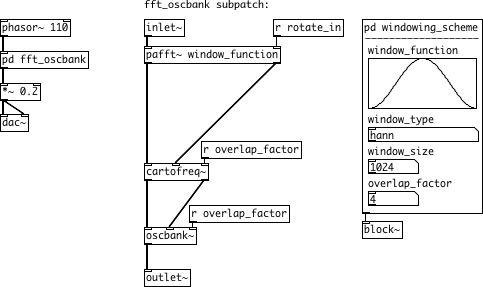 Performs a real inverse fast fourier transform then applies a window function and normalizes output.